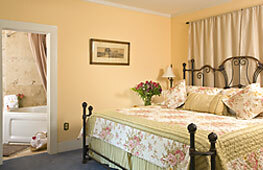 Every Room and Suite at St. Francis Inn is unique - varying in size, location, decor, configuraton, and appointments. 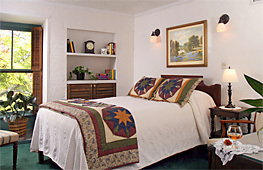 Rates vary accordingly, from small cozy rooms to spacious multi-room suites, yet all feature private bath, color cable TV, cental heat and air conditioning, telephone, and clock radio with MP3/iPod connection. Regardless of which accommodation you select, our fabulous FREE AMENITIES are enjoyed by all Inn guests. For more complete information on any room or suite, including photos, square footage, descriptions, location, and rates, click on its photo below. 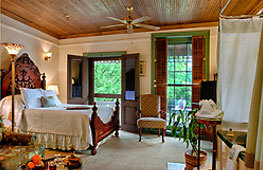 An enchanting room on the third floor with a queen bed; private old style bath down the hall with a clawfoot tub. 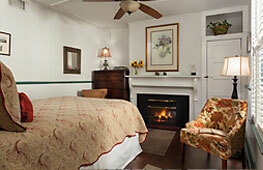 Comfortable queen bed with fireplace, direct entrance from the courtyard, old style small bathroom with a clawfoot tub. 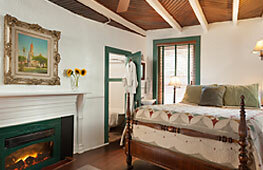 One of our smaller accommodations, on 1st floor with queen bed, a fireplace, modern bathroom, private entrance. 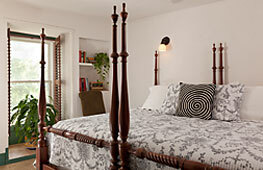 A small room with fireplace, queen bed, modern shower, access to the second floor balcony overlooking the garden. 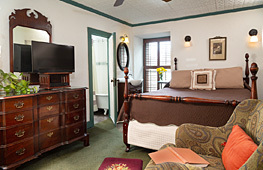 Separate from the Inn, a cozy room with king bed, whirlpool tub for 2, fireplace, walk-in shower, and outdoor sitting area. 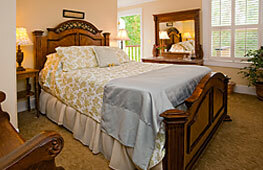 On the second floor of the Wilson House, with queen bed, full bath with whirlpool for 2 and shower, and private deck. A favorite sanctuary of many guests, with queen bed, third floor views, floor to ceiling windows, and a clawfoot tub. 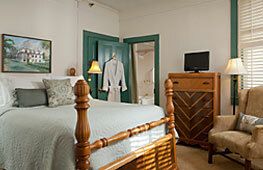 Romantic fireplace, grand carved wood queen bed, whirlpool tub with shower, located on the Inn’s second floor. 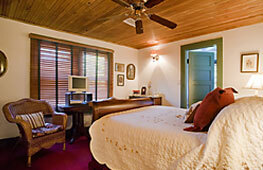 A quiet third floor retreat with queen sleigh bed, whirlpool tub with shower, refrigerator… overlooking the courtyard. 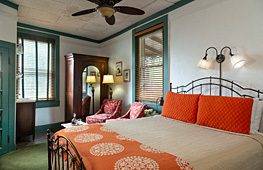 Two-room suite in the Wilson House, with king bed, whirlpool tub, sitting room with queen sleep sofa, porch access. 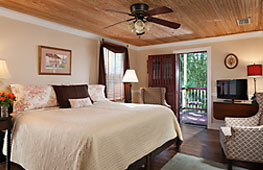 King or two twin beds, whirlpool tub, private deck and easy access to the courtyard from its first floor location. 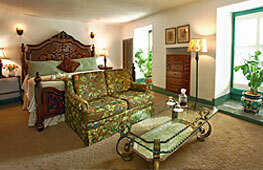 Two spacious rooms with a queen bed, queen sleeper sofa, fireplace in the bedroom, and room for four guests. 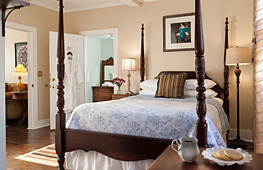 One of the Inn’s finest rooms, a spacious private retreat with a king bed, 2-person whirlpool, spectacular natural light. 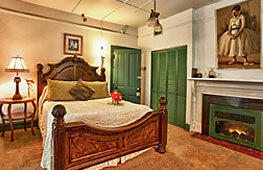 A 2-room third floor suite, with whirlpool tub for 2 & shower, king bed, sitting room, mini-fridge; perfect for 2 to 4 guests. 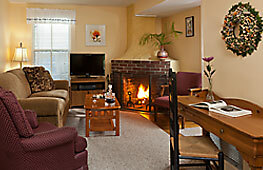 Spacious 3-room suite, queen bed, whirlpool in full bath, fireplace and queen sleeper sofa in sitting room; sleeps up to 4. 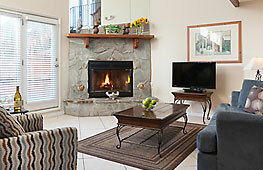 A magnificent romantic getaway... queen bed, fireplace, 2-person whirlpool, private balcony, floor to ceiling windows. The Cottage, just a few steps from the Inn has 2 bedrooms (queen bed and two twins), 2 baths, whirlpool, kitchen, living room with fireplace and queen sleeper sofa. 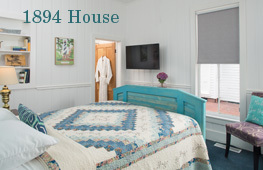 Encompassing the entire first floor of the 1894 House, with 2 bedrooms, 2 baths, kitchen, living room, two private decks, pet friendly; a few blocks from the Main Inn. 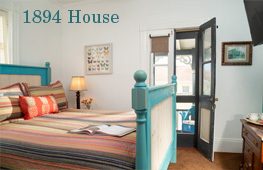 Encompassing the entire second floor of the 1894 House, with 2 bedrooms, 2 baths, kitchen, living room, two private balconies; a few blocks from the Main Inn. When you book your room, schedule a massage with our licensed therapist in the privacy of your Inn room, for great relaxation and rejuvenation. 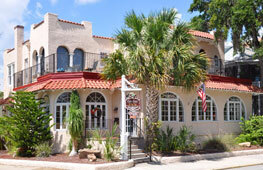 In addition to St. Francis Inn, the Finnegans own several other fine accommodations in the St. Augustine area. Casa de Suenos is a B&B just 5 blocks away; Our Beach Lodgings are at St. Augustine Beach and sleep from 2 to 8; Harbor 26 overlooks a marina and sleeps up to 4 guests. Click on each box for details. NOTE: These other lodgings are not Select Registry properties. Fabulous location in the center of the Old City's historic district. 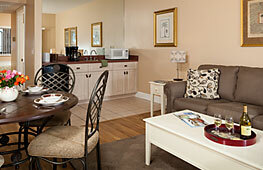 Intimate, with seven comfortable rooms; some with whirlpool tubs and balconies. 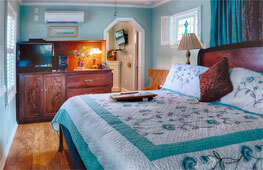 Vacation in one of our comfortable, fully appointed accommodations at St. Augustine Beach. Four unique choices await you! A one-story condominium, for one to four guests, overlooking a peaceful marina on one side and the Intracoastal Waterway on the other.